Affordable Jacqueline RSVP set includes the petite A1 matte softwhite 80 lb envelope and 100% cotton rsvp card. RSVP card in same Crane Lettra cardstock measures 5x3.5 inches. Papers for both the RSVP card and envelope are made in the USA. If you print, the rsvp card comes 4 to a sheet, so you print and cut. If we print, we cut to 5x3.5 inches. Templates for both parts comes with the kit. The RSVP cardstock is a very thick cotton, so if your desktop printer does not print thick card well, have us print or take to a commercial offset printer experienced printing on cotton paper. Glam Budget Wedding Invitations. Eco too. 100% cotton paper, with bronze handmade paper bellyband, with fabulous embossed pattern. Wow your guests with this highly tactile, sophisticated wedding invitation. 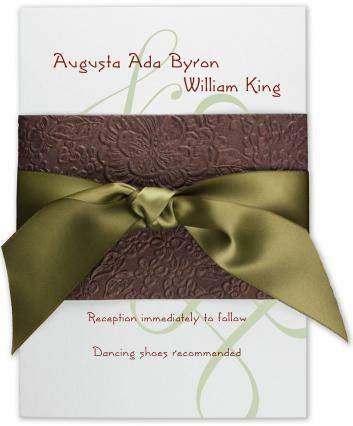 Finished with moss green ribbon that picks up the subtle tones of the background design on the wedding invitation card. Ribbon is double face satin, 1.5 inches. DIY PRINTERS: PLEASE NOTE: This is a thick paper, 110 lb. It works with about half the desktop inkjet and laser printers out there. About 3/4 of our DIY printing customers have had no problem, but 1/4 have. We've priced this very reasonably, and many customers have had us print for them. QUICK PRINT CHAINS cannot print these for you. The paper can be printed offset or digitally. Digitally, only by a good color digital print shop. Not a photocopy place. Substantial A8 size invitation. Invite Card is 100% cotton Crane Lettra paper, 105 lb. Beautiful texture, prints inkjet, laser, letterpress or offset. PAPER FACTS: Bellyband is made from recycled cotton rag, made by hand in India. Mailing envelope is softwhite 100% recycled paper with 50% PCW content. Made in USA. Mailing Envelope: Handsome softwhite 70 lbs paper envelope.